Here’s a wonderfully simple gift idea from Fingerprints on the Fridge, a great blog for moms who want to get the most out of life and have fun while they’re doing it. This simple but super cute reindeer project is easy enough for kids to do, and it’ll make a great gift for teachers, grandparents or even their little buddies. 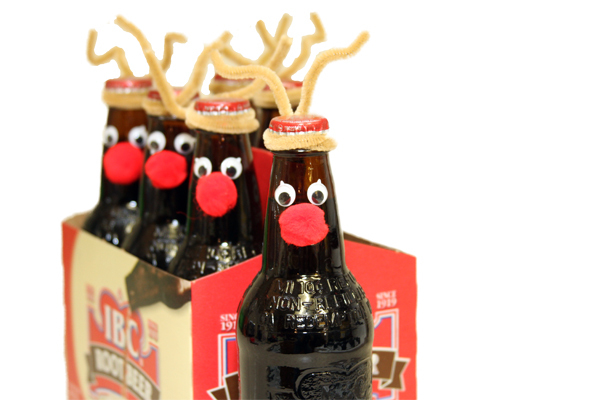 All you need are googly eyes, little red pom-poms, some dark brown pipe cleaners, a six-pack of IBC root beer (or any long-necked root beer in dark bottles) and some glue. Do you need any more instructions than that? Just show your kids the photo and they’ll be ready to get to work! Check out Fingerprints on the Fridge for more fun ideas.